Owls are famous for their exceptional eyesight and it was thought that you could gain better eyesight from them. In England, the method was to cook owl eggs until they were ash, then incorporate them into a potion. Folklore from India had a more direct method: just eat owl eyes. Owls are a sign of death in many cultures, including some Native American tribes. For instance, dreaming of an owl signified approaching death for Apache people. Boreal owl calls were a call from spirits to the Cree people, and if you answered back to the owl with a whistle and didn’t get a response, it was a sign that your death was imminent. On the other hand, Dakota Hidatsa people believed that burrowing owls acted as protective spirits for warriors, so not all owls were bad. For some cultures, the owl was sacred. Among Australian Aborigines, owls are the spirits of women and so are sacred. The Kwakiutl people also thought owls were the souls of people and shouldn’t be harmed because if the owl was killed, the person whose soul the owl carried would also die. In fact, many different cultures believed that a person became an owl after death. Most owls share an innate ability to fly almost silently and also more slowly in comparison to other birds of prey. Most owls live a mainly nocturnal lifestyle and being able to fly without making any noise gives them a strong advantage over their prey that are listening for the slightest sound in the night. A silent, slow flight is not as necessary for diurnal and crepuscular owls given that prey can usually see an owl approaching. 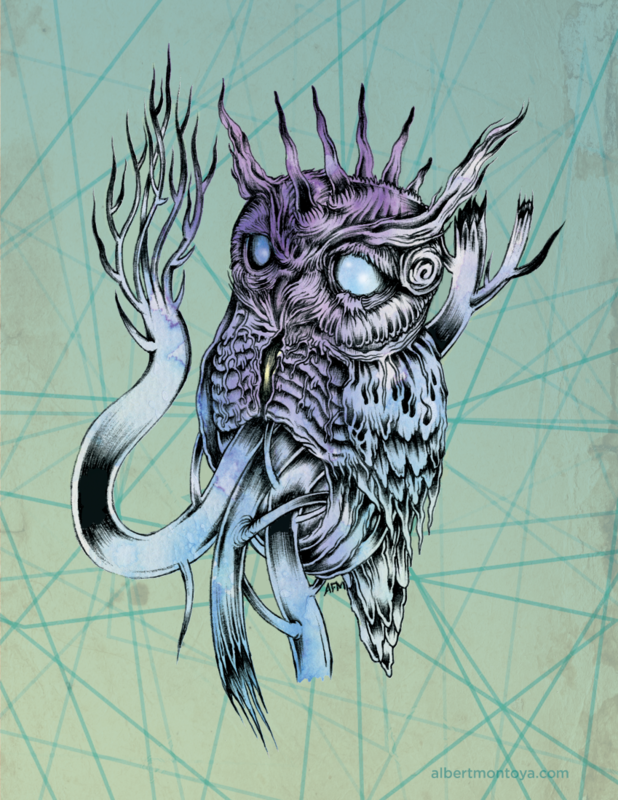 Here is my tribute to the famous owl, titled “Silent Flight” mixed media illustration, (pen, ink, watercolor, digitally colored) 2016.